Derby 132 is made from a soft brown material with black button eyes and a white “star” patch on his forehead. His mane and tail are made from a fluffy chestnut-brown coloured material. He wears a lime green saddle pad with the Kentucky Derby 132 logo on it. At the starting gate…and off they go! Derby 132 was released on 31st March 2006. His birthday is on 6th May 2006. 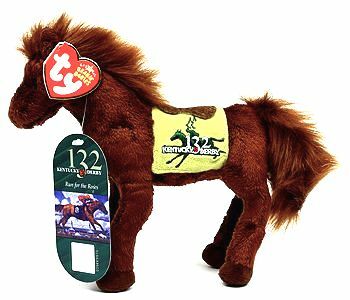 This is the Kentucky Derby store version of Derby 132 which has an exclusive swing tag. There is also a retail version. Both versions have the same style number. He was retired on 27th April 2006.